I bought this palette using the Macy's gift card that my mom gave me as a part of my birthday present so I ordered this one online instead of going to the department store and buying it. I usually would go for Sephora but I thought it was better to save some money and just buy it with the gift card along with some other makeup goodies. When I received the parcel from Macy's I was so excited to finally received this palette however I was a little bit disappointed when I opened it because Junkshow and Ace were chipped from freight handling. :( This usually happens when you buy palettes from department store and I should know better but I decided to just settle for it. 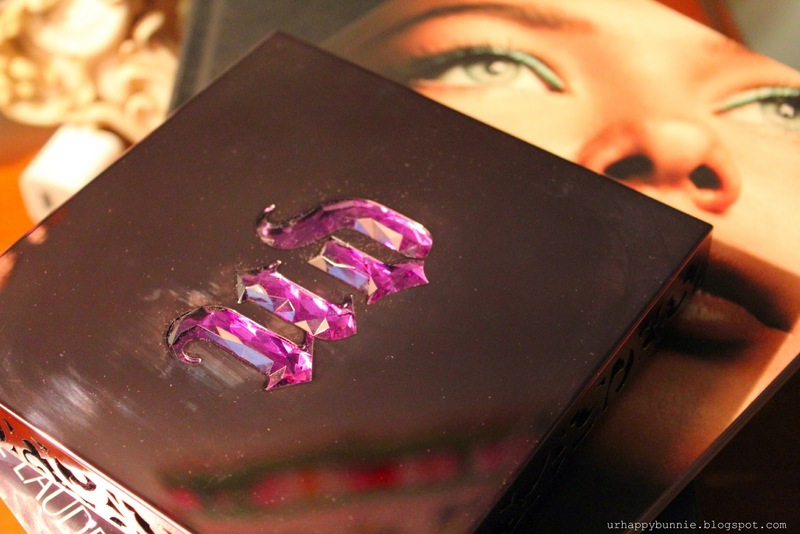 First off, awesome packaging - signature Urban Decay purple color, bejeweled logo, nice filigree details on the side of the lid, and reflective gunmetal cover! Inside the lid is a nice wide mirror and of course the 15 amazing shadows and underneath the shadows is a velvet-lined bottom which can double up as a hidden jewelry box. There is a good amount of neutral colors albeit shimmery and glittery and a fair share of in-your-face-brilliant colors. The first column on the left is clearly the neutral side, the middle is the bright one and the last one are the smokey colors. The shadows are so soft, buttery and smooth, that I was able to easily press back the chipped Junkshow and Ace. 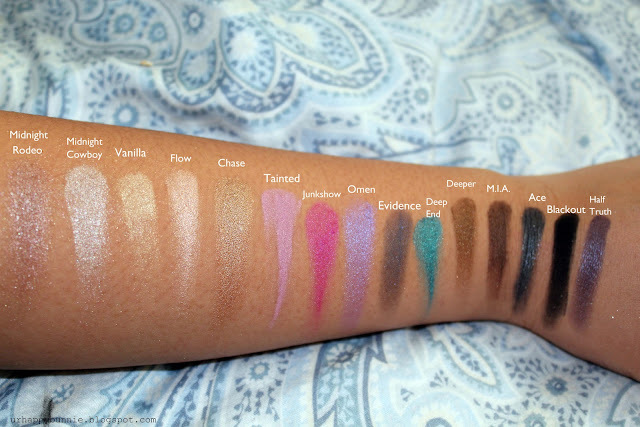 Of course, as expected of Urban Decay, their shadows are highly pigmented and blendable. I really love this palette and though it lacks matte colors except for Blackout, that really doesn't bother me much because I love frosty and shimmery eyeshadows rather than matte. I'm not much of a glittery shadow fan because of the fall outs but you could really work with Midnight Rodeo and Midnight 15. My favorite colors would have to be Omen and Deep End but I noticed that I have used more often the two brown colors which are M.I.A. and Deeper. The only color that I really haven't used at all and wasn't really impressed with is Tainted which is the lighter shade of pink as opposed to the bright Junkshow. In fact, I prefer to use Junkshow even if I'm not fond of wearing pink on my eyes. 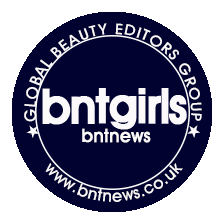 This is a great palette especially for collectors since it really is very beautiful and it has a variety of colors that could be great from day to night! I suggest that you grab yourself this palette if you have a chance because this is really an amazing palette. 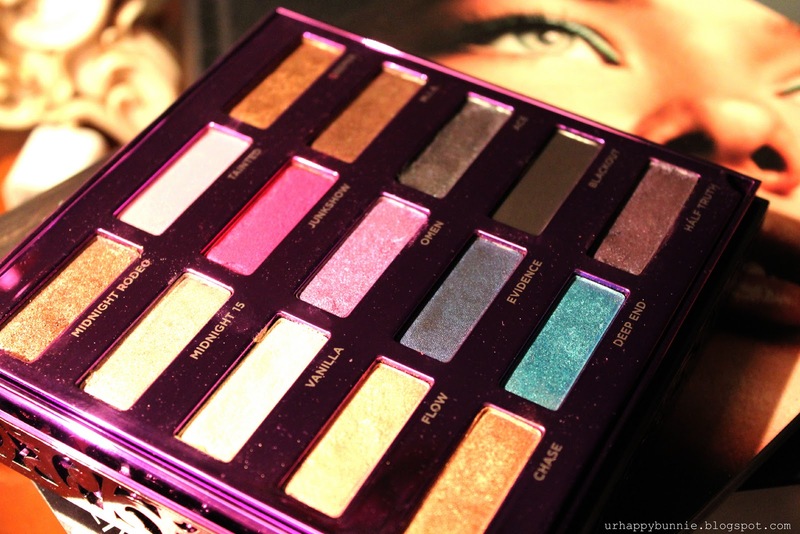 now i totally want this palette!! :D :D good swatching. are those all the colours though or only some? by the way, i think you're super pretty! !